Straddling the equator, the Galapagos islands are volcanic in origin and several volcanoes in the west of the archipelago are still very active, especially those on Isla Fernandina, Isla Isabela and Isla Santiago. 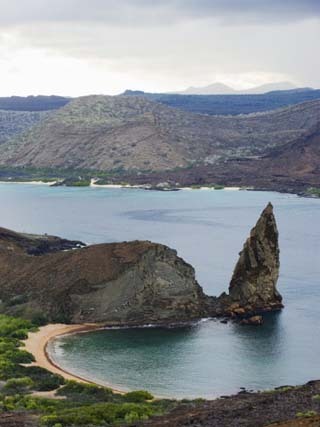 The overall Galapagos group consists of 15 main islands, 3 smaller islands, and 107 rocks and islets. The largest of the islands, Isabela, measures 4,640 sq km (1,790 sq mi) and makes up half of the total land area of the Galápagos. Volcan Wolf on Isabela is the highest point, with an elevation of 1,707 m (5,600 ft) above sea level. The youngest islands, Isabela and Fernandina, are still being formed, with the most recent volcanic eruption in April 2009, on Fernandina. Many of the 100 islets (rings of coral reef) and larger islands are fringed by a white sand beach.